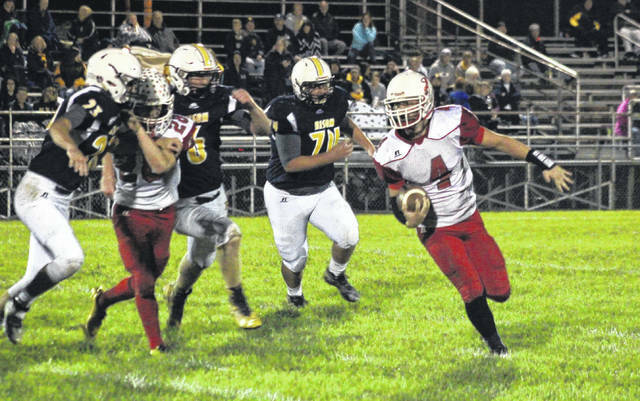 Wahama’s Brady Bumgarner (4) runs behind a block from teammate Colton Arrington (28) during the White Falcons’ overtime win on Friday in Buffalo, W.Va.
Wahama’s Johnnie Board (15) and Jacob Fisher (64) hit Bison senior quarterback Ethan Burgess (2), causing an incomplete pass on the BHS two-point conversion try in overtime of the White Falcons’ 20-19 victory on Friday in Buffalo, W.Va.
BUFFALO, W.Va. — Wahama’s season came down to one final play and the White Falcon defense came through to cap 2017 off in style. 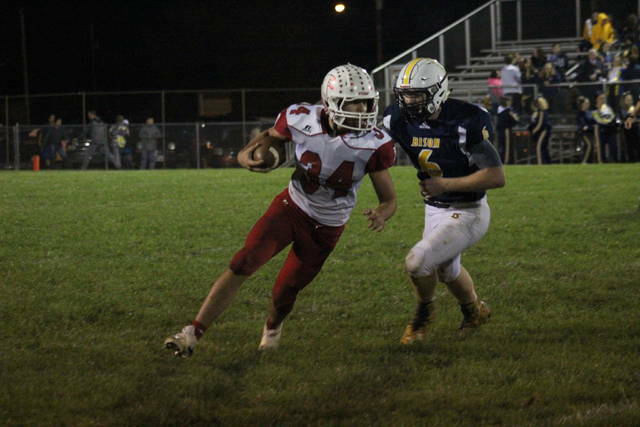 The Wahama football team stopped non-conference host Buffalo on a two-point conversion try in overtime on Friday night in Putnam County, sealing the White Falcons’ 20-19 victory in the season finale for both teams. With the win, Wahama (5-5) — which was coming off a bye week — will finish the regular season with a win for the first time since 2013, snapping a three-year skid against the Bison (2-8). The hosts led initially in the game, as senior quarterback Ethan Burgess capped off a seven-play, 69-yard drive with a two-yard scoring run. Burgess also kicked in the point-after, giving the Bison a 7-0 lead just 5:57 into play. 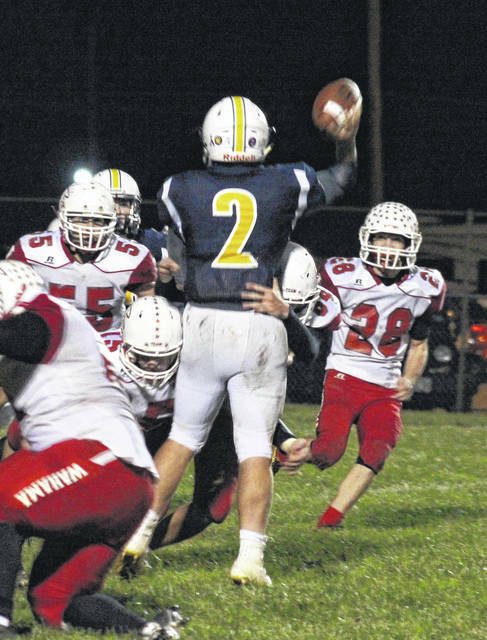 Wahama answered on its first drive of the second quarter, as a one-yard touchdown run by Christian Thomas punctuated an eight-play, 70-yard drive. Christopher Hesson added the point-after kick, tying the game at seven with 10:53 left in the first half. The White Falcons took their first lead on their next drive, going 67-yards in 11 plays with Thomas scoring on a 14-yard run. The point-after kick was missed, however, leaving the Wahama lead at 13-7 with 2:07 remaining in the half. Buffalo made it into White Falcon territory on the ensuing drive, but fumbled the ball away on the 10th play, with just 13 seconds left in the half. The Red and White committed their lone turnover of the game on the first possession of the second half, fumbling the ball away on the BHS 48. The turnover proved costly, as the Bison covered 52-yards in seven plays, with Burgess delivering a touchdown pass to Chance Jones from 22 yards out. The White Falcons blocked the point-after kick, leaving the score tied at 13 with 5:30 remaining in the third period. Wahama didn’t advance beyond the BHS 27-yard line in the second half, losing possession on downs twice, while punting once. The Red and White defense didn’t allow the Bison to run an offensive play from the red zone in the second half. The White Falcons had possession first in overtime, and Thomas started off the extra football with a six-yard run. After just making it back to the line of scrimmage on second down, WHS senior Colton Arrington broke a nine-yard run to give the guests a fresh set of downs from the BHS five. A run apiece by Thomas and Arrington moved the ball to the BHS one-yard line for third down. On the third down play, senior Johnnie Board took his first carry of the night across the goal line for six points. Hesson added the point-after, giving the guests a 20-13 edge. The BHS offense had its chance to answer, and Burgess tossed a four-yard pass to Stephen Booth on Buffalo’s first play. After a failed running play and an incomplete pass, Burgess found Booth again on fourth down, this time for 16 yards and six points. 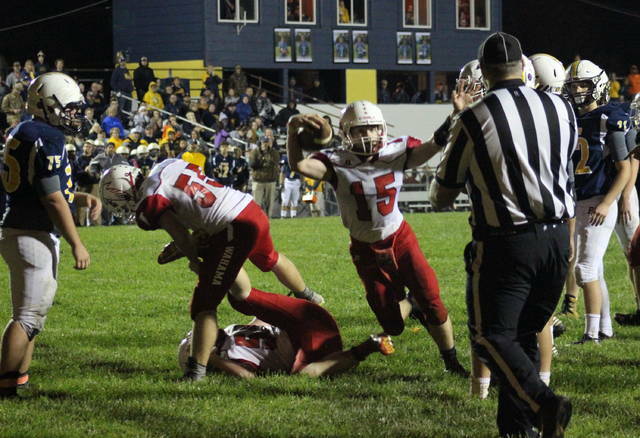 On Buffalo’s two-point conversion try, Board and Jacob Fisher hit Burgess as he was trying to pass, the ball fell incomplete in the end zone and Wahama celebrated the 20-19 victory. For the game, Wahama held a 15-to-12 advantage in first downs and a 316-to-276 advantage in total offense, including 228-to-107 on the ground. Both teams committed a turnover apiece and were penalized eight times each, WHS for 60 yards and BHS for 70. Thomas led the White Falcon offense with 117 yards and two touchdowns on 30 carries, to go with one 15-yard reception. Arrington rushed 14 times for 71 yards, while Brady Bumgarner gained 40 yards on nine carries. In addition to Board’s one run for a one-yard touchdown, he also caught one five-yard pass. 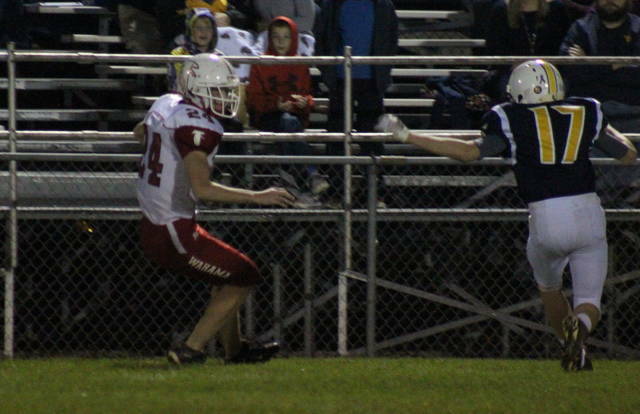 Jacob Warth and Coltyn Hendrick added a reception apiece, gaining 49 and 19 yards respectively. WHS senior Bryton Grate was 4-of-6 passing for 88 yards. On defense for the White Falcons, Fisher had a team-high two tackles for a loss, while Board and Hesson each had one. Hesson and Fisher both sacked the Bison quarterback once. Burgess led the hosts with 98 yards and one touchdown on 25 carries, to go with 12-of-21 passing for 169 yards and two touchdowns. Booth ran four times for nine yards and hauled in a team-best five passes for 62 yards and one score. Tyler Morlachetta caught four passes for 54 yards, while Jones had three receptions for 53 yards and a touchdown. This marks the final game in the Red and White for seniors Coltyn Hendrick, Bryton Grate, Johnnie Board, Garrett Snouffer, Colton Arrington, Christian Thomas, Carson Eades and Christopher Hesson. This is Wahama’s first overtime victory since the 2012 Class A State Championship game, in which the White Falcons won 43-42 on a successful two-point conversion. The 2012 season is also the last time the WHS won headed into the offseason, as well as the last time the White Falcons were involved in a one-point game.